A grill-flavoured fest with lots of cheerful music will be held near the Peter and Paul Monastery close to the town of Lyaskovets, not far from Veliko Tarnovo. The event will take place from September, 1st till September 6th. This will be a special celebration dedicated to the quality and tradition of Bulgarian taste accompanied by nice music and the aroma of tasty temptations sizzling on the BBQ. 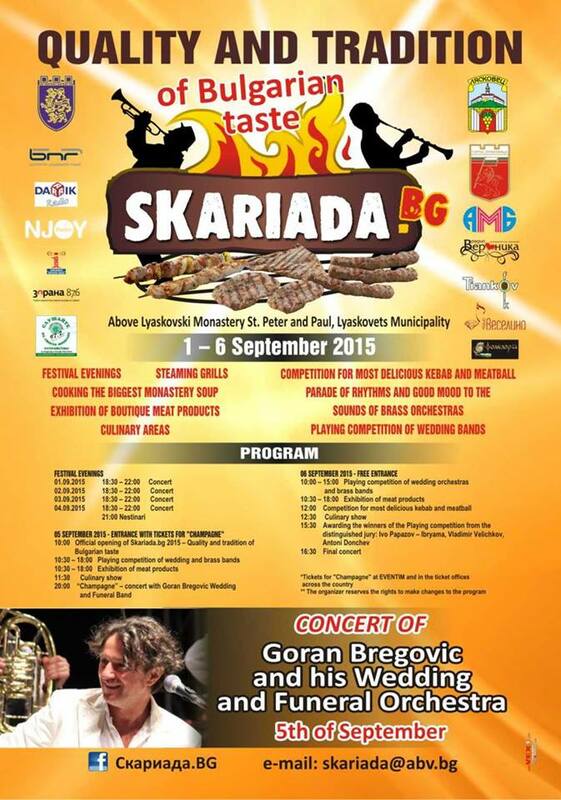 Bulgarian producers will present traditional meat products and dishes, and foreign chefs will show their masterpieces at the event. Producers of certified organic meat products and boutique meat products following old authentic recipes as well as companies specializing in the production of fresh meat delicacies will also have stalls where you can try and buy what you like. The exhibition will be complemented by many sizzling grills, cooking areas and a competition for the most delicious kyufte and kebapche. Visitors will also witness the preparation of the largest monastery style soup. 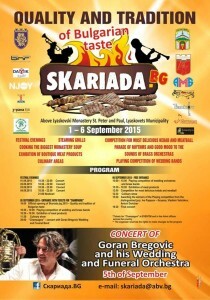 The official opening of Skariada.BG will be on 5th September at 10 am. Tickets for the concert Champagne Concert of Goran Bregovic will be needed on that day to enter the premises; tickets can be purchased at www.eventim.bg and cost 15 and 30 leva. The concerts itself starts at 8 pm. Access to the other days of the event is free.